Calgary became an internationally-known city in 1988, thanks to hosting the hugely successful Winter Olympic Games that also left this city with a legacy of buildings and sports associations. It also marked the birth year of Riddell Kurczaba Architecture Engineering Interior Design Ltd. (RK). Over the past 30 years, the firm has been able to boast of great success and continues to be a respected force in the community. Architect John Riddell left Winnipeg to move to Calgary and begin his career when, unfortunately, the city was hit by the major 1983 recession. Undeterred, he strove on designing small- to medium-size projects and was fortunate to be introduced to engineer Ron Kurczaba through a casual conversation with a business colleague of Ron’s who just happened to be sitting next to John on a flight back from Toronto. They arranged to meet. Ron, who was working with Lavalin, was engaged in employing architects from time to time on a wide range of building projects, and was able to find a little architectural work for John on an electrical substation for the northwest leg of the LRT. This also marked the beginning of a growing friendship. 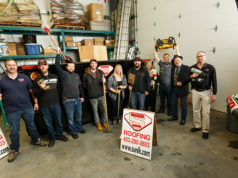 The first major project they worked on together was converting the former Banff Mineral Springs Hospital to a student hostel; they enjoyed the relationship and explored the possibility of continuing to work together, eventually establishing the business partnership they salute with this year’s 30th anniversary. It was not an easy time to launch as Calgary was in the doldrums and few major construction projects were on the drawing boards, but RK was able to win the renovation and expansion of the former Calgary Real Estate Board building along 5th Avenue SW. John says he was a little chagrined at having to change the original award-winning J. H. Cook design, but happy to see it is still working as a small commercial building in downtown Calgary. From the outset of the newly-established firm, the partners created a culture whereby the relationship they were enjoying blossomed by surrounding themselves with good people, and the right people. The firm achieved early success with sophisticated facilities geared towards advanced electronics manufacturing. The Novatel CIMplex plant was followed by projects for Nortel, Hughes Aerospace, and Amtek among others. The crowning achievement was the Computing Devices Plant, a project that Calgary was in competition with other Canadian cities to attract. 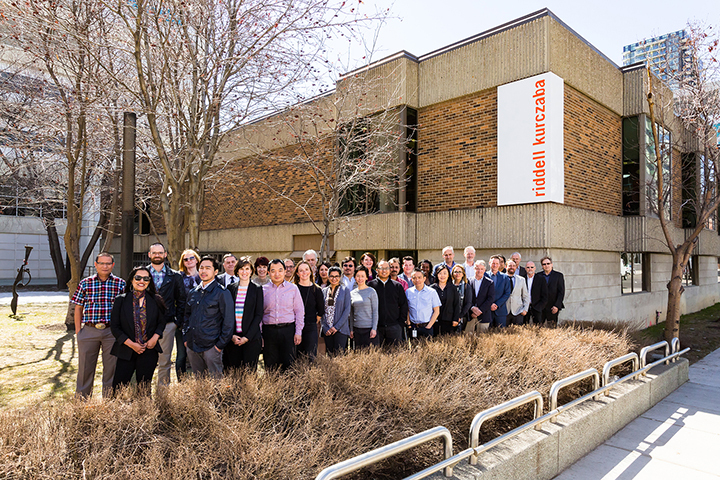 Beyond technology, the firm took great pride in delivering several important cultural projects for its First Nations neighbours such as the Tsuut’ina Administration Complex, the Siksika Protective Services Building and the Calgary Native Women’s Shelter. 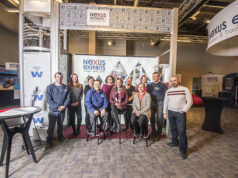 In 1988, RK received a world-class perspective on the industry when it teamed up with major design firms to undertake the interior fit-out for TransCanada’s newly-merged business with Nova Gas. One of the earliest and most important business lessons Ron received was that “no one comes looking for you.” As a result, RK set up a dedicated marketing and communications’ team focused on promoting the unique attributes and capabilities of the company. This team, capably led by senior associate and vice president of marketing Niha Prased-Kroliczek, has helped lift RK onto the national and international stage. They were able to establish the right relationships with their growing portfolio of clients. Remington Development Corporation is a major one that RK has been proud to work with since 1999. Ron recalls looking over the barren former gravel extraction site that has become Quarry Park, Remington’s outstanding live/work/play southeast community that evolved into one of North America’s foremost mixed-use developments. RK won the process to design the Jacobs building. The park’s biggest building to that date, the 475,000 square-foot, four-storey structure over a 22.5-acre site earned RK an International Best Office Architecture in Canada Award. Since then RK has designed the majority of office buildings in the park including the South Campus Calgary headquarters for Imperial Oil – five interconnected buildings totalling 880,000 square feet, the most significant suburban office building in the city. RK had already completed a similar major development for Fluor Canada. 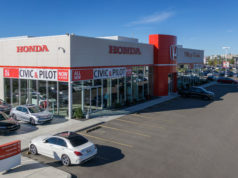 Ron and Niha had learned of the company’s holding of 50 acres of land on the east side of Macleod Trail and its plan to put it on the market and then engage a developer to construct its new building there. They were able to convince Fluor to undertake a feasibility study on the potential of keeping the land and acting as its own developer. The result was RK being able to design a magnificent 225,000-square-foot office complex with a focal 10,000 square foot curtain wall atrium. RK also produced a master plan for the rest of the site that was developed as Sundance Place. The oil and gas industry has been a key part of RK’s business since a concerted effort was made in 1992 to reach out to the EPC/EPCM firms that Ron worked with during his start in the industry. One of the first to respond was Bantrel – part of the Bechtel Group – and the success in completing many of their projects resulted in earning more work in providing services to many more companies in the industry. Recently, RK completed a two-storey, 40,000 square foot office building and a 30,000 square foot warehouse/shop for Pembina Pipelines in Grande Prairie and Drayton Valley, and seven buildings in Sturgeon County for North West Redwater Partnership (NWR). The success in continually winning oil and gas projects, many of them located in northern Alberta and across Western Canada, meant the firm was able to grow and diversify into other disciplines, giving architects and interior designers different challenges that they rose to with some tremendous results for a host of wonderful clients. Through persistence and tenacity – and the good balance between the different fortes of the two partners – the company has grown from strength to strength. Adding experienced and talented staff and earning interesting projects in a variety of sectors has resulted in what today is a multidisciplinary company able to tackle any kind of demand. Its portfolio of completed projects includes some outstanding examples of the diversity they have received accolades for over the years. In association with Gensler, RK delivered Enmax Place, which won three BOMA Awards. It is a comprehensive redevelopment of an existing building as well as a complete interior renovation to become the 320,000 square foot new corporate headquarters and operations centre for Enmax. Clients are great motivators and it was thanks to Remington Development’s expansion into the Edmonton market that RK opened an enterprising office in the provincial capital to better serve their long-standing relationship. A notable project is the South Central Business Park consisting of nine industrial buildings, each one in excess of 100,000 square feet – a significant project in the Edmonton market. Earlier this year, Scott Pennock joined RK as its new managing director of interior design. Armed with 23 years of experience in Canada, the U.S., Australia, Singapore and the U.K., Scott has specialized in corporate, commercial, hospitality and residential interior projects. Currently directing a number of exciting projects, including Alberta Health Services in Strategic Group’s CN Tower in Edmonton, he joins a studio proud of a wide range of interiors including restaurants, custom residential, a large number of offices, the Citizenship & Immigration Court, Hotel Alma at the University of Calgary, and huge projects like the Jacobs and Fluor interiors. Another dimension of the firm’s offerings to industry was the launch of a specialty fire and building code solutions department to deal with code compliance and life safety, offering consulting services to help other companies through the maze of code challenges. John Riddell has always had a passion for technology and was an early tester of 3D imaging. His interest in the advancement of interactive videos was primed when Fluor asked for a full-on animation so they could “walk” through their new building in the design stage. The result was primitive by today’s standards, but effective in that it produced a deep buy-in by everybody in the Fluor organization, and it set RK on a technology journey that has seen the company as a leader in offering – through RK Visualization – the highest-quality computer-generated stills, animated marketing videos, and virtual reality (VR) that transports you into spaces as if you are actually there. Good examples of the power of persuasion VR can achieve are the west leg of Calgary’s LRT, the award-winning YYC LINK shuttle production; the first animated promotion for East Village using aerial drone footage; animated journeys around and through the New Central Library, capturing feeling of grandeur of the new public space; and depicting a quality and sense of place at University District. Currently the team is visualizing Arlington Street’s investment vision for the redevelopment of 17th Avenue. RK’s VR is able to encourage stakeholders and persuade chosen audiences in understanding how developments will actually be completed. Being involved in the marketing of developments has also led RK into offering branding and other promotional tools; it recently completed a full advertising/promotional package for Sixty West, a new residential community in Sylvan Lake. The newest RK service offering stemming from its continual research and advocacy for higher accessibility standards, was the formation of RK – Access, a division led by architect Erin Shilliday in collaboration with Nabeel Ramji who experiences daily getting around in a powered wheelchair. It provides accessibility audits, design enhancement, and project implementation to address all aspects of accessibility design and construction methods. Blessed with good fortune, the firm has a culture of giving back. Whether it is 10 years as platinum sponsor for the Remington Charity Golf Tournament in support of prostate cancer research, working with elementary students with their tin-can creations, or contributing studio design reviews and professional mentorship to architectural students, RK is always there.